“The road to hell is paved with good intentions.” And from what it looks like, the foreseeable future that’s changing along with the climate is that hell. Artist David Opdyke’s exhibition changes the way you see the world and the bigger picture, both literally and figuratively. His politically-charged art attempts to stir something in you, something nostalgic yet foreign. By creating a feeling of longing for the past and reaching for the future, he grounds you in the present. There is a sense of chaotic unity in the gridded mural landscape. It alleviates the gravity of climate change through its absurd humor while leading us through an anxious journey that some people wouldn’t be able to go through by themselves. 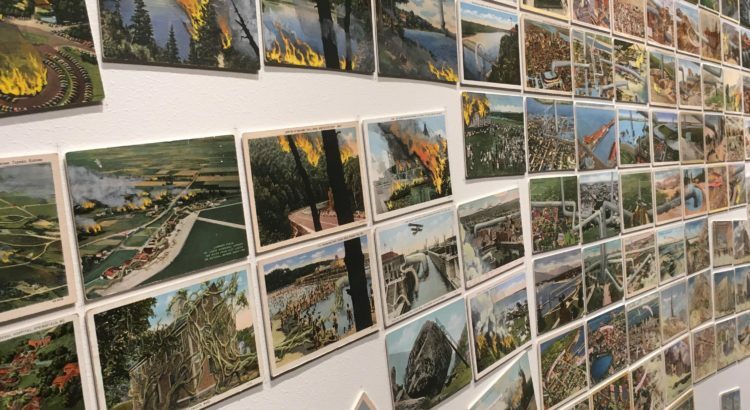 The postcards create a personal relationship with the viewer, using scenes and landscapes we may recognize and defacing the postcards with his drawings in a fashion similar to how we deface the actual landscape. “Paved with Good Intentions” utilizes different levels of intimacy. The installation works both from a distance and up close, and the intricacy of the details pulls you in, requiring you to step closer and look at every single postcard before stepping back out to see the whole picture. This work requires more time than you think it would take to look at everything, precisely because of how much there is to see. Every postcard is interconnected, from the tornado to the fire to the flying frogs, putting a global layer to something so local. The accompanying animation of his postcards uses a slapstick humor inspired from Monty Python’s “Flying Circus.” It uses a different media to convey the same message in a more animistic way. The world is too big to quantify and the enormity of the climate change crisis is too large to fully encapsulate, but David Opdyke tackles it through something as simple and recognizable and approachable as postcards. Set aside some time to stop by the Institute for the Humanities to experience this humorously serious exhibition through February 26.